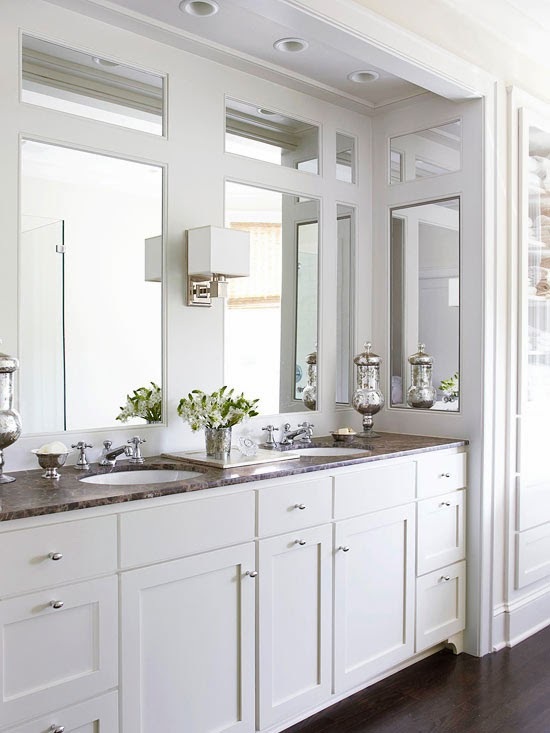 We have listed five popular trends we have been seeing in Bathroom Design and Decor. Do you have any of these new style elements in your bathroom or have you thought of making any of these changes? Let us know what you think! Bathrooms are becoming a place of retreat where we are spending more time. Many want to be as comfortable in there as in any other room and enjoy the same level of style. The same decor found throughout the home is being brought into the bathroom - Art, Area Rugs, Furniture and Fireplaces are becoming more and more common as our bathroom style is evolving. Good-bye plastic tumblers and vinyl shower curtains! They are being replaced by the same quality decor found throughout the home including fabric drapes, elegant chests, beautiful table lamps and artwork! 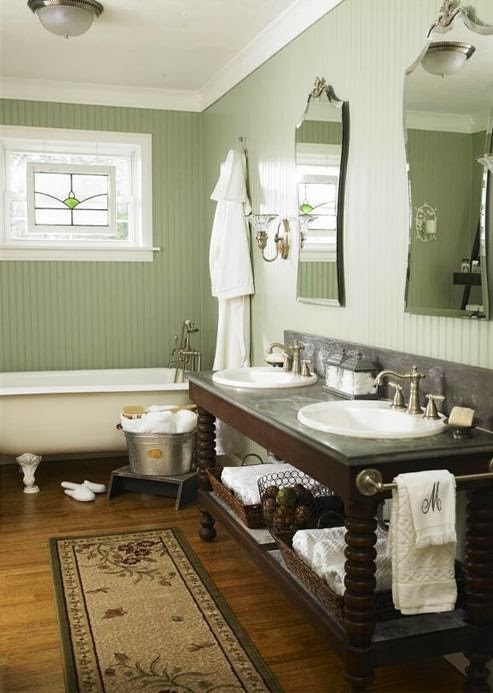 Traditional bathroom accessories have been replaced with beautiful home accents and decor. More and more bath accents and accessories are coming from "Home Decor" collections and are being re-purposed as bath decor. Items made with glass, porcelain and wood can be easily cleaned and make stylish and even functional bath accessories. 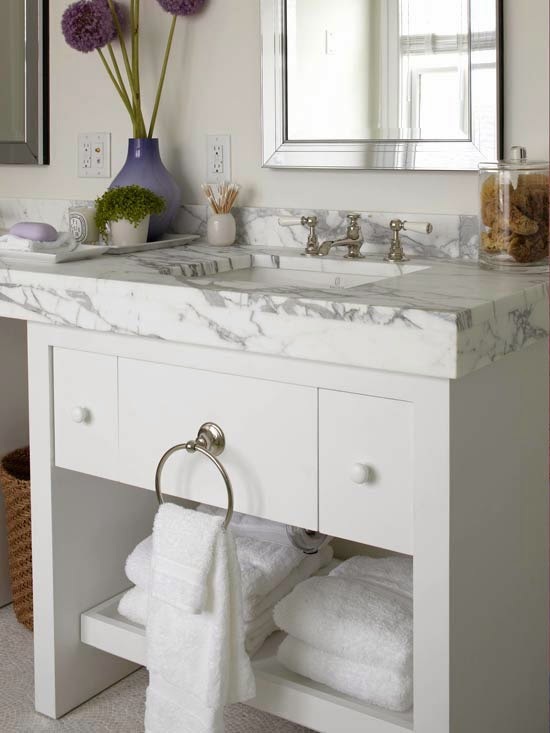 The lighting, floor rugs and mirrors could be used in any room but look just as beautiful in the bathroom! 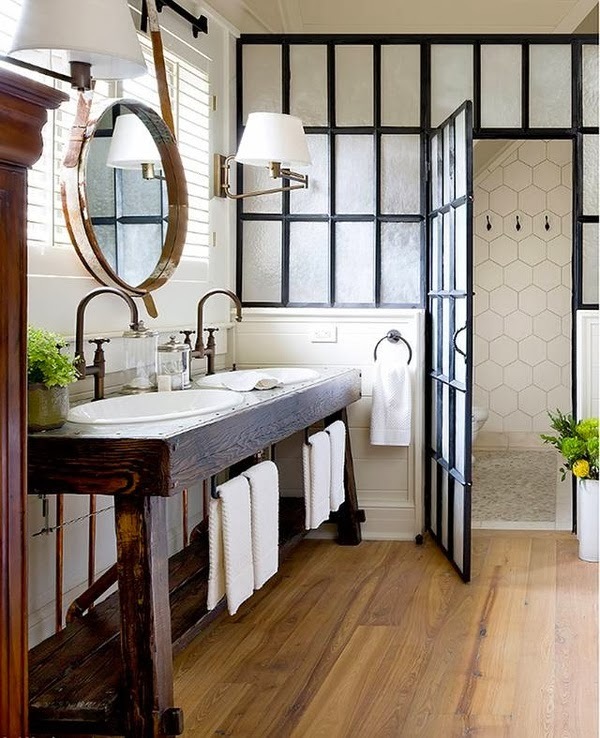 With the durable finishes now available, hardwood floors are becoming more popular in bathrooms. The warm rich flooring is a perfect complement to clean sleek white cabinetry and/or bathroom fixtures. Warms meets clean and bright and what a happy combination they make in the bathroom! The rich varied tones in the the hardwood floor contrast with the sleek white tub (right) making it look like jewelry on top of velvet. 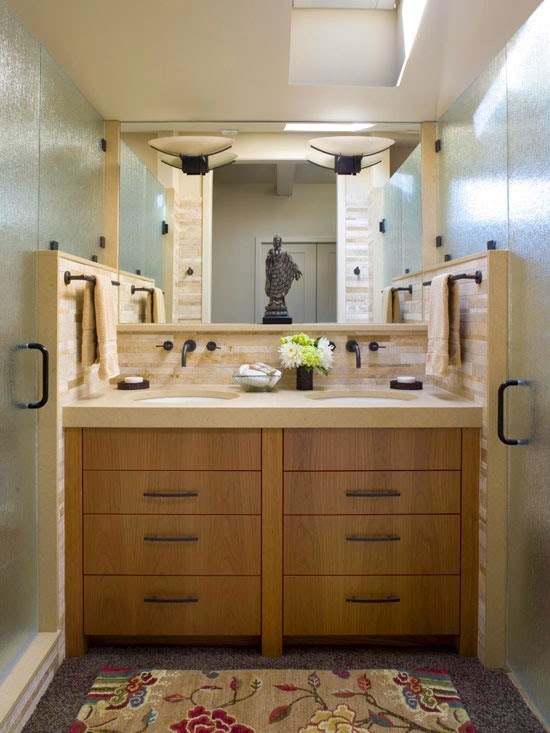 Wood can warm up a bathroom that otherwise may be cool and sterile looking. All white cabinets (right) look clean and fresh, but might have been a little overwhelming and cold if not for the contrast of the wood flooring. With the new finishes, wood flooring can be easy to clean and trust me, feel much better when standing on your feet and legs than concrete, tile or stone. Intricate patterned or boldly colored tiles are adding unexpected style, color and pattern to the bathroom floors in todays homes. Once reserved only for grand entry ways and main areas, mosaic and painted tiles design elevate the bathroom floors like never before. Classic black and white tiles are also coming back, paired with bright colors or a classic black and white decor. 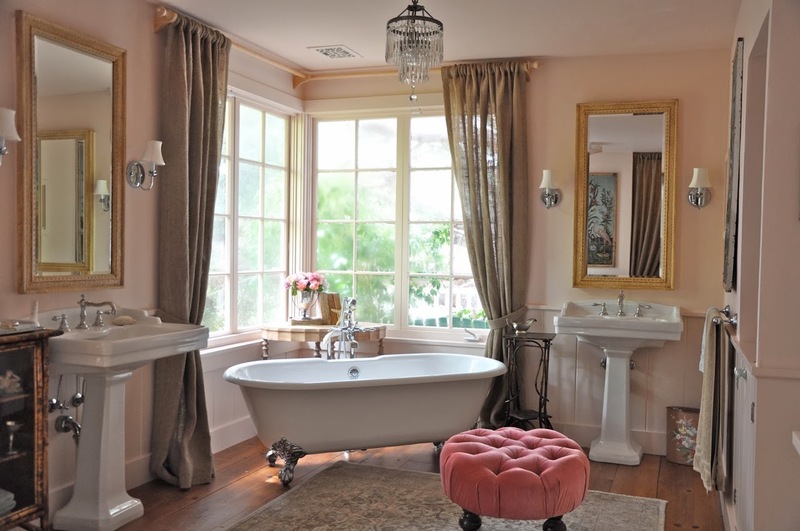 They complement the vintage style clawfoot tubs nicely and add interest and pattern to any room, but even more so in the bathroom. New synthetic fiber area rugs are becoming an affordable and decorative option to use on bathroom floors. They can be cleaned more easily, plush on the feet and can add much color and pattern on an otherwise bland floor. It was only a matter of time until they made their way into the bathroom. 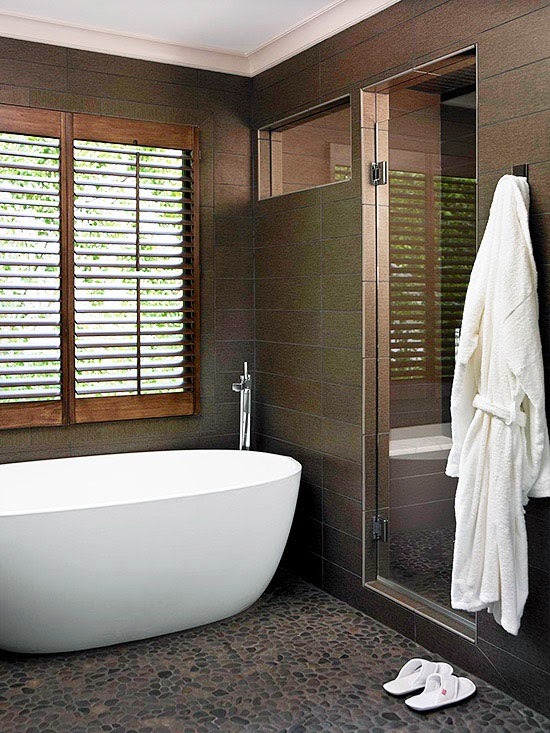 Durable bathroom flooring options are almost endless. Another popular material used are river rocks or pebbles. They feel smooth on the feet, are easy to clean and extremely durable. They add a very natural earthy element to any room, as well as some texture, pattern and color. It may be 2014 but vintage style is going strong. Fixtures and plumbing from years gone by are as popular now as ever. Reproduction faucets with vintage styles are available from almost all the major companies and they sparkle like jewelry on marble countertops topped with subway tiles. 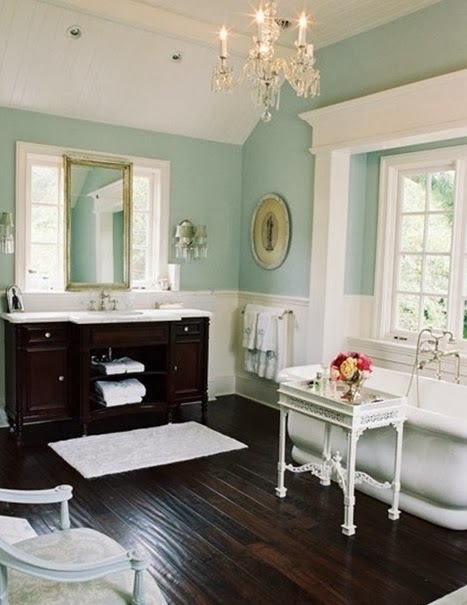 All the bath decor is vintage style down to every small detail. Sconces, mirrors and countertop accessories are have all the glamour of years gone by, but all made with modern technology of 2014. 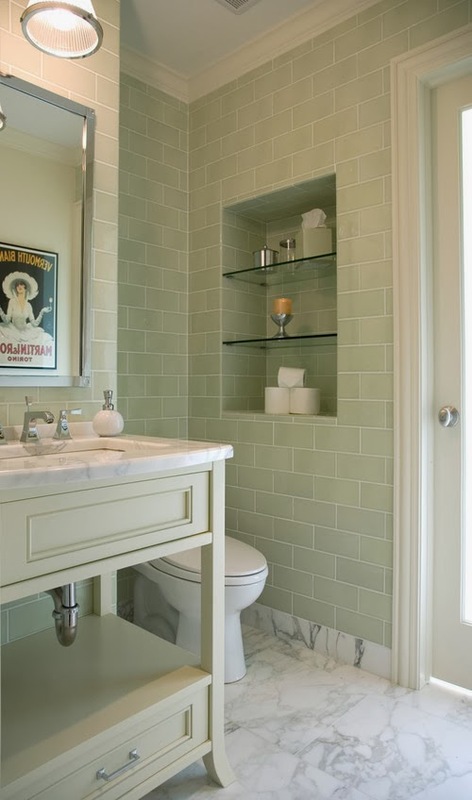 Did I say Subway tile and marble? It is almost everywhere and in every bathroom. It is "the" go-to tile for many bathroom renovations and see on every other home improvement makeover show. Marble, too is making a big comeback. If you notice the images it is also seen in 4 out of 4 of our examples. It pairs with subway tile like PB & J. Also very popular is open shelving. It is gaining popularity in both the kitchen and bathroom and is often seen with a vintage design or style. 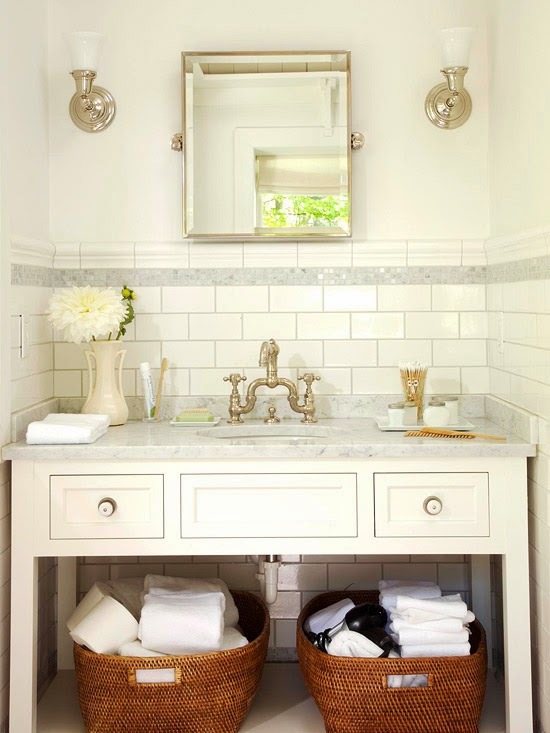 The open shelves are good for storing bath towels either stacking right on the shelves or in large baskets to keep them contained. With the majority of Baby Boomers reaching their 50's and 60's, the term "Aging in Place" was coined. Many bathroom renovations are planned around that concept of adapting your home to meet your present and potential needs. 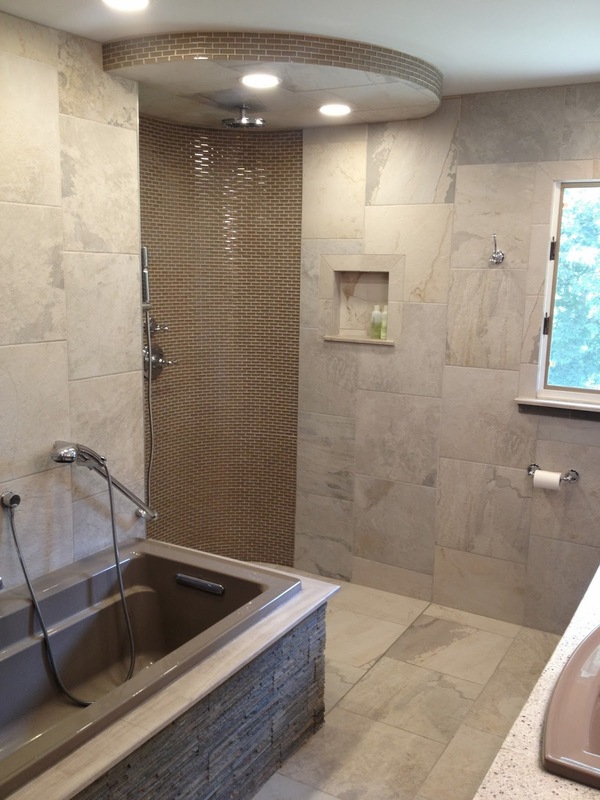 One of the more popular Aging in Place bath design concepts is the open, curbless or accessible shower. A curbless shower is accessible with a wheelchair and thus the name accessible shower. If it not uncommon for renovations to include removal of a Master Bathtub and replacing it was an oversized Master Shower. 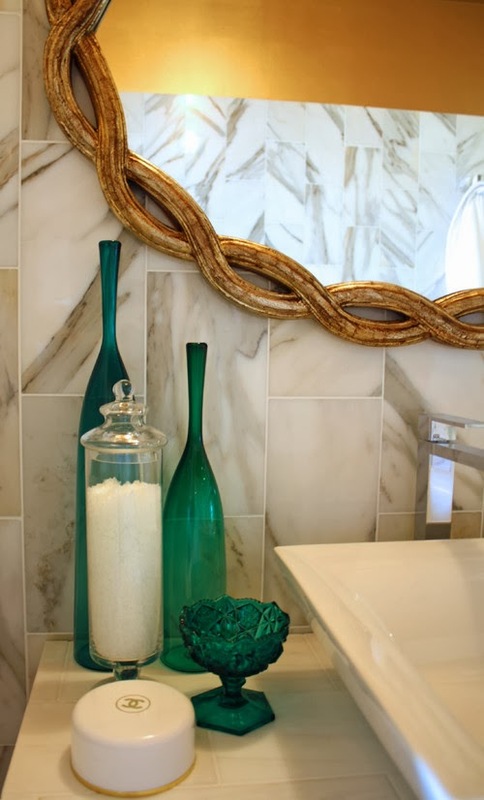 They are becoming the centerpiece or focal point of the master bathroom. Related to aging or not, the open shower design is becoming a more popular option for some people. 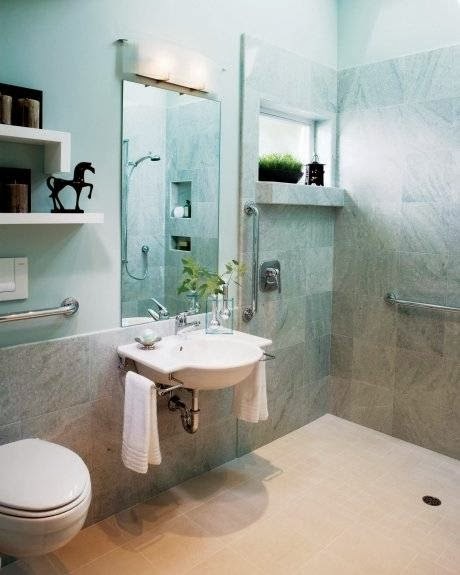 An advantages of the open shower is there is minimal or no more shower door glass to maintain. After years of cleaning large glass shower doors, the open shower is an attractive alternative to the constant cleaning. It can also be a design statement, with very unique and unusual configurations used to incorporate this feature into a bathroom.